Merry Christmas! I hope everyone has had a wonderful holiday! Here's another little peek at our new printed patterns. They are currently on boats and planes shipping to stockists all over the world and will very shortly be available to you! My family Christmas was excellent - and complete with both a fondu (Christmas eve with my side of the family) and a turkey dinner (Christmas day with Matt's family). Soooo much wonderful food and even more wonderful company! I received a few unusual and very thoughtful sewing related Christmas presents under the tree and thought you might be interested to see what people managed to get for the sewer who [almost] has everything when it comes to the sewing studio! My brother-in-law and his girlfriend (the talented graphic designer, Sonia Bishop who has designed our packaging!) found this solid piece of sewing gold disguised as your average vintage sewing guide. Many books claim to be 'complete guides' but this REALLY is a complete guide to sewing! I'm so thrilled with it! Does anyone else have this book? I think I might remember a comment several months ago in which it was referenced. It is a Reader's Digest book from 1976. It has extremely thorough and easy to understand illustrations (which I'm sure will be very useful to refer to whenever I am writing pattern instructions) and it is cleverly organized so that relevant information can be accessed within seconds. Whenever a subject is also mentioned in a different part of the book, the page number and title of the section are in bold at the top of the page - I have never seen that in a reference book before and think that will prove to be incredibly handy. Best of all, and much to my surprise, there is a little 'Men and Boys' section hidden near the back of the book which was at first a laughing point for Sonia and I when we compared the number of pages to other sections of the book. I flipped to this section and was shocked to find that it is not an empty bunch of repeated sewing tips that have been shared with the women's section. In fact, the short chapter manages to fit in everything from properly and fully tailoring a high end coat (AMAZING!) to constructing shirt collar stays and a classic yoke for a button-up. I'm really excited about the tailoring techniques that the chapter teaches. The straight forward instructions and detailed illustrations make pad-stitching and constructing a chest piece seem like challenges that could readily be conquered rather than mysterious techniques better left to old-world tailors. While these high end tailoring techniques won't be included in the Goldstream Pea Coat instructions (they are written for sewers who are completely new to sewing outerwear), you can certainly expect to see tutorials in the future so that you can apply some of these tailoring techniques to our pea coat pattern! From my parents I received two very useful sewing tools. 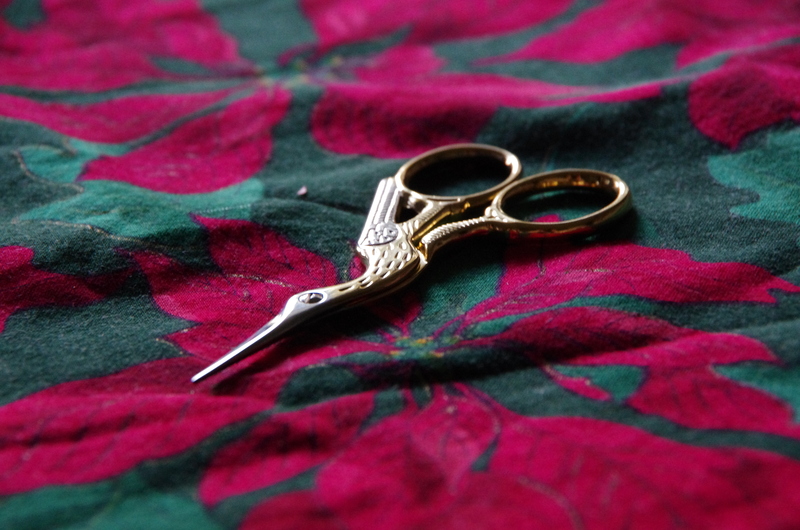 I had coveted the Lee Valley stork-shaped thread snips that a girl used in my fashion design program for quite some time so I was very pleased to receive a set of my own! Aren't they lovely? Coincidentally, I also gave a pair of these to my mother-in-law, I hope she will like them as much as the whole fashion program did (the poor girl who owned them was constantly having to 'borrow' them back from other classmates). 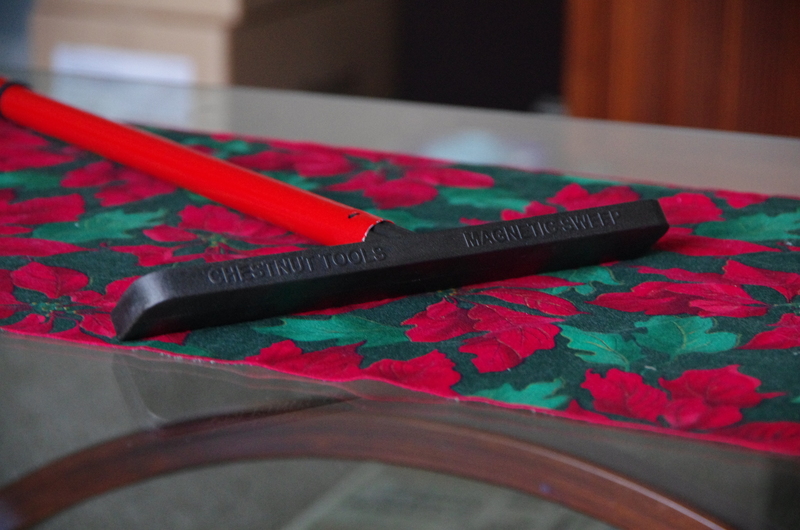 The other tool my parents gave me was was also for Matt. Matt is constantly (but good-naturedly) complaining about pins on the floor (and in his feet). While I think Matt is equally as handsome as Ryan Gosling, he somehow doesn't quite have the patience for pins that the dream man does! lol Behold the end of Matt's worries and pain! It's a magnet 'broom' that I can quickly run along the sewing room floor (and wherever else I dragged my projects and pins to in the house) after I sew each day. Easy as that! Did you receive any sewing related presents this year? Thanks for replying here :) That’s great to hear you’re planning to sew a Newcastle! At the rate you are learning it shouldn’t be too long until it is a feasible project. Feel free to email or comment with any questions you have while you’re sewing it! 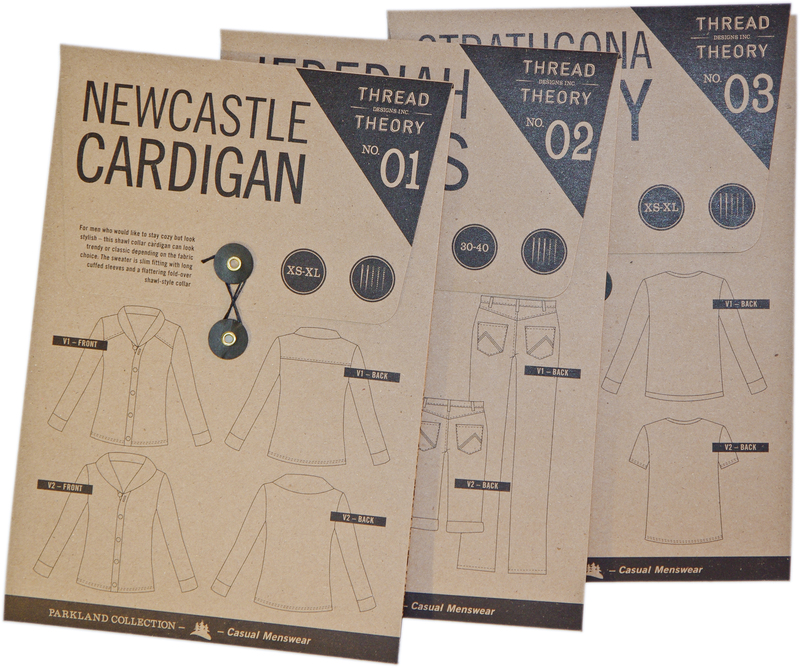 I love the illustrations you have been doing of each pattern you sew…I hope you do one for the Newcastle too, I can’t wait to see it! My grandma gave me that book and I love it. Can’t wait for your printed patterns. I’m going to buy all three :) My goal this year is to sew some items for my husband and he likes your designs. It’s ‘Classic Tailoring Techniques: A Construction Guide For Men’s Wear’ by Roberto Cabrera & Patricia Flaherty Meye. Published about ’83 I think! Okay, I will! You sound like you are searching much more actively than I am though so I imagine you will be finding a version sooner! I just respond here: The book already proved to be very helpful! I had some trouble (no surprises there I’m a beginner) with a technique of a trousers pattern that was just shortly explained in the pattern instructions. Btw I’ve already bought the newcastle cardigan from one of the german stockists on friday even though I have to learn more things before I can try my hands on it. But I couldn’t resist, the printed pattern looks just perfect. I always appreciate it when people put so much work and thoughts in a good design! My mum has that book and when I was a teenager she offered it to me several times, only to be brushed off because I thought it was so old to not be any use. I have been thinking recently I need to get it off her after all, but I keep forgetting when I’m actually in Nelson (it’s too heavy to ship!). I’ve also been thinking of making a magnet mop but I figured it didn’t work that well on carpets?? So had put it off, but luckily my husband hasn’t stood on any pins (in a long time), I think his brain is trained to scan the floors before walking anywhere. That books looks fantastic!! And the patterns too, I cannot wait to have them here!! Happy New Year! The magnet mop I have works well over our carpet. I don’t push it down into the carpet when I use it, just brush it over top. Works like a charm! I have Metric Cutting for Menswear by Aldrich and have found it very good – she uses similar methods and instructions to those I used in school so it was an easy transition for me to use her book (even more so than using our school’s comparatively confusing textbook). The fabric in our photos is actually a 15 year old table runner (featuring poinsettias) that my Mom made for Christmas decor and handed down to me! It has held up well, hasn’t it? Good luck on your book hunt! What is it called? I’m always on the look out for tailoring books too! 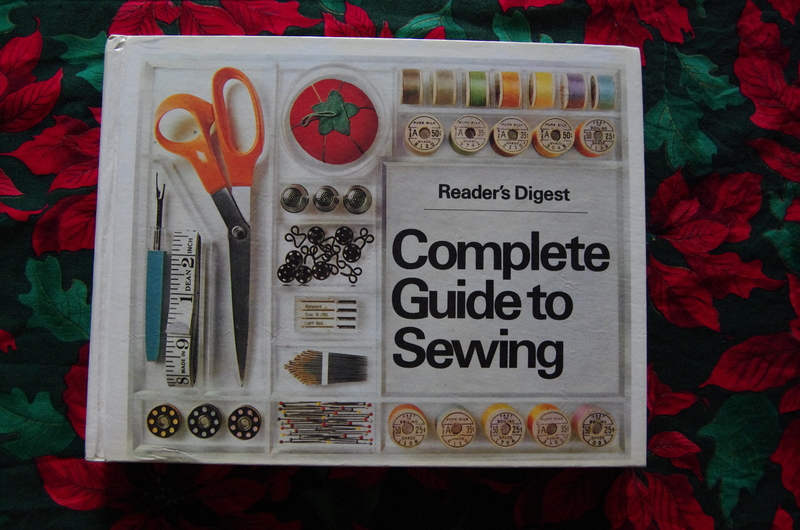 I have the same exact Readers Digest “Complete Guide to Sewing” and I Love it! Of all the sewing books I have I probably refer to this one the most. Excellent reference guide! Oh my goodness—the magnet mop! Never heard of such, but what a genius implement! I got a copy of Metric Pattern Cutting for Women’s Wear by Aldrich—hoping it’s a good one. By the way, what is that gorgeous fabric in a couple of your photos?! Ha ha, I was just looking at my copy of Complete Guide to Sewing the other night! I probably should get a magnet mop for my husband on his birthday! I’m am sure he would be pleased to see me use it! I have that book too. It’s a gem. There were some sewing presents under the tree for me too. A pattern & some fabric that I had a big hand in selecting!